Bienvenue à Restoration Counseling and my page! Emotions, emotions, emotions, we all have them, and it does not take much for them to start feeling out of control. Ignoring them does not work for long, and, as difficult as it can be, the journey to understand and deal with them is well worth it. Sometimes that journey is something you can manage on your own, and sometimes you need some help from an outside resource. If you are finding yourself in need of another resource, I would be honored to join you on that journey by serving as your counselor. Keep reading to find out what you can expect if we start working together. When emotions run high it can sometimes seem like no one understands you. In fact, you may not even understand yourself! I offer a safe and empathic environment that promotes my understanding your struggles and your own understanding of what is going on in your life. As a counselor I can often spot connections, identify themes, and provide information that help you understand and feel understood in your current difficulties. You may have guessed this by now, but I think emotions are important. I will teach you how to be aware of and name your emotions, but not just so you can “feel” all the time. 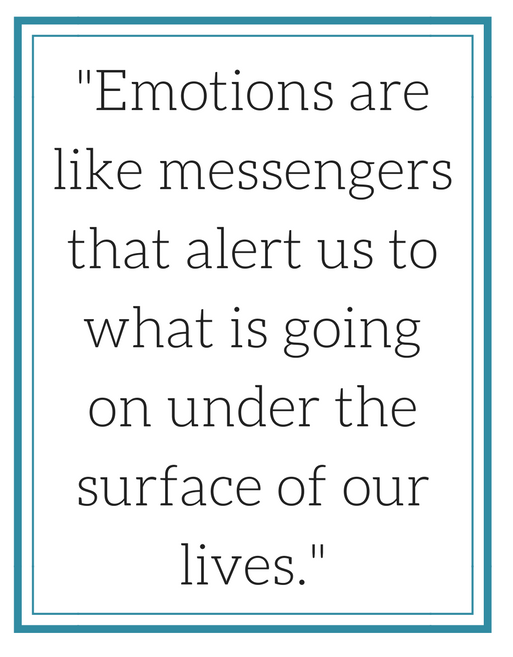 Emotions are like messengers that alert us to what is going on under the surface of our lives. I will help you make sense of those messages and live in a way that you get to choose how you respond to them rather than just reacting to what you feel. It is easy to feel frustrated and overwhelmed when you are trying to take care of things that do not belong to you, or when you are trying to get someone else to take care of what really belongs to you. I will help you identify what is your responsibility and take care of it while setting boundaries and releasing what does not belong to you. My whole worldview and approach to counseling is based on the Bible and what is has to say about God, humans, sin, grace, and life in general. That perspective shows up in the way I approach counseling, but also plays out practically with the incorporation of Scripture verses into sessions and homework assignments. Lots of distorted views are out there on emotions, God, relationships, suffering, responsibility, and much more. I consider it an honor to be able to walk with people as they identify what is really going on in their life and work to bring about change, growth, and healing. I firmly believe no situation is hopeless in light of God’s power and grace. I am passionate about sharing that hope with others and providing the support needed to facilitate the hard process of growth and change. Counseling is not often easy or simple, but it is definitely worth it. I stay busy working on a PhD, seeing clients, running, spending time with friends, and hanging out in my hammock as often as possible. I’m originally from Georgia and have been in New Orleans since 2011. I love spending time outside, being with friends, cooking, running, learning, sleeping, and drinking coffee. Campfires are quite possibly my favorite thing in the world. I’m involved in ministry to the homeless population of New Orleans and value cultivating friendships with people from different cultural and economic backgrounds than me.